When you are a first year teacher, you will have many different aspects of teaching to manage. In addition to designing lesson plans and actually teaching students, you will need to come up with an effective classroom management plan. Record keeping and organization can be a very time consuming aspect of classroom management. You need to set up systems that will help you keep track of all of the different records you need to keep on each student. Once you do this, you can focus on the other aspects of your job. One of the best things you can do is to keep good records. In addition to grades, you need to record any times that you sent notes home, if you had to report a student to the office, or if you contacted a parent directly. Some of grade keeping software has a place where you can easily input this information along with your attendance records. If you do have written correspondence, it’s always a good idea to keep it on file so you can refer back to it at a later date. Having a centralized system or DMS for managing your data and documents will help keep you efficient and organized. Another very important aspect is to keep up with grading papers and making sure you’re entering them correctly into the computer. This will help you avoid problems when it’s time to submit your grades. You will be handling physical documents from students frequently—using a document scanning solution will streamline this process for you. You should also keep a careful record of all of your lesson plans. 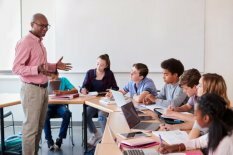 Before you begin teaching for the year, you may want to set up a master calendar and determine which core curriculum aspects you are going to cover in each unit. This will give your lessons more focus, and make it easier to determine which core aspects you want to include in each lesson. Keeping a binder or folder of your lesson plans will save you time when you teach the subject again next year. Be sure to take notes or document things you would like to adjust to make your plan work better over time. As a teacher, it is important to have the parents on your side. One easy way to do this is to send home a disclosure statement at the beginning of each year or each semester. This statement clearly outlines class rules and explains your policy on makeup work, attendance, and extra credit. Including a calendar that outlines what you will be covering each month gives the parents an idea of what you’re tackling each month. If you are teaching elementary school students, a weekly newsletter can really help build your relationship with parents. Be sure to keep physical or digital copies of that on file too! It helps to consult with other teachers about any aspect of managing your classroom. They may be willing to share lesson plans for a unit or give advice on dealing with a difficult student. If you’re on a team, you may want to coordinate your assignments to help the students get deeper into the curriculum. Other teachers can be one of your best resources. Students will rise as high as you challenge them to. If you set clear expectations the first few weeks of school and expect your students to adhere to them, you will have an easier time managing your classroom all year. Be sure to clearly post the rules you want your students to follow so there’s a clear understanding that every student needs to respect your rules and your classroom. It also helps to be available to offer extra help after school or before school as needed. This lets the students know that you care about them and will help them when they need it. Some school districts have begun implementing a mentoring program for new teachers. Studies have shown that new teachers with mentors are more successful and will continue to teach after the first year. If your school does not have a mentoring program, you should look for one on your own. Usually finding someone within your department will be the most helpful. If you can talk about your concerns with someone who understands what you are going through, you will have a better chance at being successful. If you can establish a positive relationship with your students, they will respond better to your teaching. It is important that you respect your students in the classroom. You can also work on this by offering tutoring and review sessions, being open to make up work or extra credit and by establishing clear guidelines on expected behavior. If you come into the classroom with a positive attitude each day, that helps too! Finally, in order to make it as a teacher, you need to make time to have fun with your students. When you plan an engaging interesting lesson plan, you will have the chance to have fun. You can also offer behavior rewards or rewards if the class average is above a certain percentage on a test or assignment. You are the one who determines how much fun you have in your classroom. Need Secure Offsite Storage for Your Teaching Records? Overtime schools accumulate thousands of current and historical student and business records. Record Nations will help you find a secure offsite storage facility where you can conveniently access your records as often as you need, while keeping them safe. We can also help you find a document scanning service near you to help make your classroom digital. Call us today at (866) 385-3706 or fill out our form to get free quotes from several document storage service and document scanning service providers in your area. Tips for the Beginning Teacher: This lists several tips that will help you as you begin teaching in your first classroom. 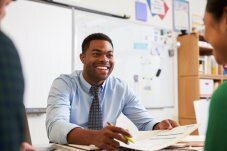 Survival Guide for New Teachers: This is an extensive guide to navigating your first year as a teacher. Classroom Organizing Tips: These tips will help you set up an organized classroom. Parent Teacher Conference Resources: This page has printable guides and other tips to help you set up and have effective parent teacher meetings. Clean Up Your Act- Create and Organized Classroom: this talks about the benefits of a clean and organized learning environment and how to establish one in your classroom.